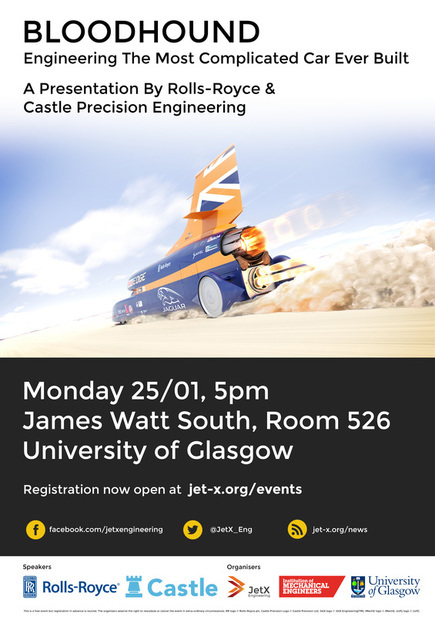 ﻿The Institution of Mechanical Engineers in cooperation with JetX Engineering & the University of Glasgow present to you a speakers event on one of Britain's most challenging engineering projects. Engineers from Rolls-Royce and Castle Precision Engineering involved in the making of the Bloodhound will give a short presentation on what is like engineering the most complicated car ever built. The event is open to the public with free admission, but registration is required. There are currently no tickets available for this event. You can join the waitlist in case tickets become available nearer the date.